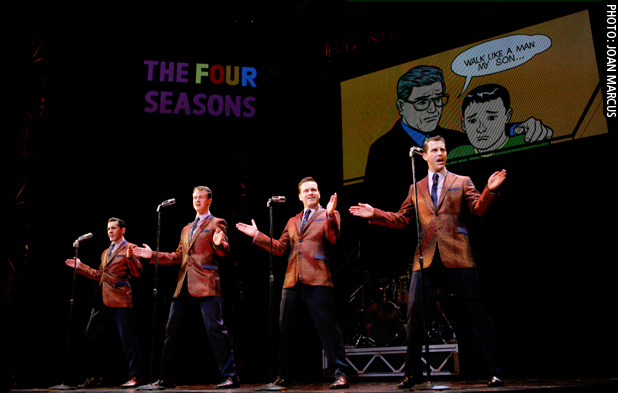 The hit musical Jersey Boys, which chronicles the lives and careers of Frankie Valli & The Four Seasons continues its run in Toronto Canada at the Toronto Centre for the Arts and in the month of June the 1,000,000th customer will have seen the Toronto production. A startling accomplishment when once considers that the Toronto run is still only in its second year. Riveting Riffs Magazine had the privilege of reviewing this extraordinary musical which regularly plays in sold out theater venues in Australia, London and Las Vegas and has been produced on Broadway for more than five years. As good as Jeff Madden is at portraying legendary rock idol Frankie Valli, in our opinion two other actors overshadowed his performance, Quinn Vanantwerp as Bob Gaudio, one of the members of The Four Seasons and the songwriter behind hit songs such as, “Sherry,” “Big Girls Don’t Cry,” “Walk Like A Man,” and “Dawn.” The casting of Vanantwerp was a stroke of genius as he possesses the good looks and boyhood charm of sixties idols such as Bobby Rydell and Bobby Vee. Incidentally, Bob Gaudio also produced the soundtrack for the Original Broadway Cast Recording of Jersey Boys. Daniel Robert Sullivan, as the wayward (that is an understatement, however we are being kind here) Tommy DeVito, is absolutely brilliant. Tommy DeVito’s gambling addiction continually plunged the band members into debt at the height of their careers. Daniel Robert Sullivan is splendid in portraying the manipulative behavior of a person with addictions who fails to see the problems he causes, and instead tries to turn the tables and blame it on every other member of the band, including Nick Massi (played by Michael Lomenda) who was DeVito’s roommate when the band toured. Based on the book by Marshall Brickman and Rick Elice, Jersey Boys does not try to make this a feel good Cinderella story. It is the story of a group of men who rose from a very tough existence in New Jersey, two of whom spent the early parts of their lives in and out of jail and how Frankie Valli’s loyalty to the various members of the group was legendary; “Because that’s the way we do it in Jersey.” Having had the opportunity to meet Mr. Valli in the fall of 2009, he still exudes the same charm and graciousness. This however, is also the story of a man who lost his marriage to Mary Delgado (actress: Cleopatra Williams) and later to a woman who loved him (portrayed by Élodie Gillett) and it is the story of a man whose daughter died when she was twenty-two years old. The music directed by Ron Melrose is spectacular and you would expect no less from a musical that audiences all over the world keep returning to see over and over again. The choreography by Sergio Trujillo is breathtaking and Director Des McAnuff is to be commended for staging an incredible production. Jersey Boys is not just a musical, it is an Experience. It is an Event. For me Jersey Boys ranks up there with when I first saw Cats. Frankie Valli & The Four Seasons dominated the charts and radio airwaves like few artists ever have and more incredible Frankie Valli went on to a solo career and once again rose to # 1 with “My Eyes Adored You,” # 6 with “Swearin’ To God,” and the smash hit, theme song for the musical “Grease.” For those of who may be too young to have lived during the musical successes of Frankie Valli as a solo artist and with The Four Seasons, and who may be concerned about their ability to relate to the music, this musical dispels those concerns from the onset, because it is more than a musical it is a gripping story, filled with drama and humor and Oh Yes, plenty of fabulous music. If you are in Toronto, New York City or wherever else Jersey Boys is now playing, do yourself a favor and buy a ticket, if you can afford to, buy two and take a friend.